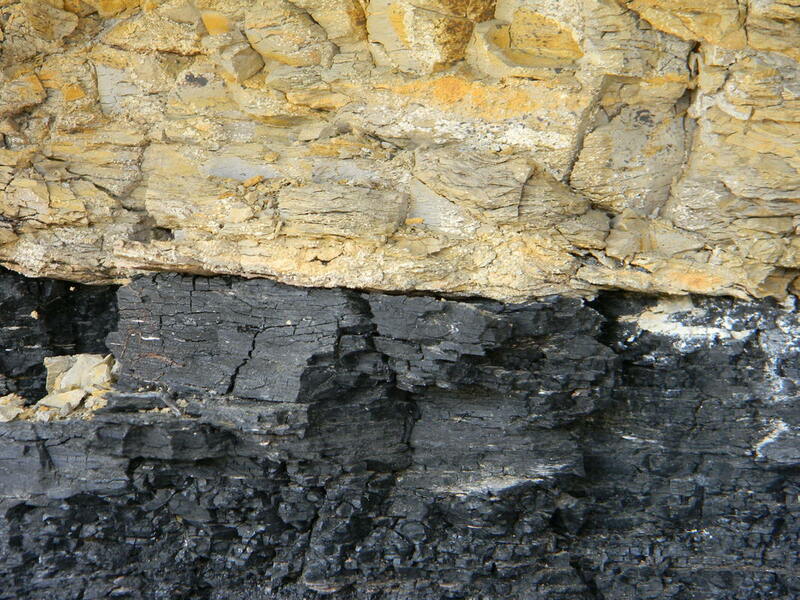 Contact of a coal seam and the sandstone strata above the coal seam. There is no (or very little) mixing. The coal gives the appearance of having been compacted vegetation (in an aqueous fluid) that was rapidly covered by a thick aqueous sand layer. Heat, drying and pressure would have chemically rapidly changed the vegetation to coal. Photo by JGL in New Mexico. JGL note: The "floating mat" model has been considered consistent with the worldwide Noah Flood by Austin and others. Dr Steven Austin received his PhD in geology at Penn State. He studied coal formation. How Did We Get All This Coal? Dr. Andrew A. Snelling "It appears that lush vegetation might have covered up to 75 percent of the pre-Flood world, including the floating forests fringing the land. The Flood waters rose from the oceans and swept over the land, catastrophically destroying and burying all the vegetation in beds between other fossil-bearing sediments. The temperatures and pressures at these depths, aided by the presence of water and clay, converted these beds into coal within months.